As the risks of climate change become more widespread, more control regarding how to safeguard the environment is being put in place. Environmental controls are promoted by governments and associations to preserve their environment, not only related to off-shore or contract production, but also for product and packaging disposal. Conclusively, manufacturers must pay meticulous attention to the environmental consequence of their services. Are you up to date on the latest standards? Every global trade professional must be informed of the different environmental controls in action in a given market. The curated program on Export Import Management from iiiEM outlines the significance of environmental controls. Environmental controls differ from country to country and from product to product. For instance, the performance of the agri-food sector is exactly related to the environment. Current issues are associated with the use of pesticide and herbicide, the release of chemicals into waterways, recycling of a particular percentage of products, and the warehouse of dangerous waste. Environmental packaging controls present food businesses with challenges due to existing health standards already commanding stringent restrictions. Revisions to packaging mandated by controls can make the product less favorable for customers, which can harm sales. Breaches of environmental controls are much more critical to the wide public, particularly in developed nations. 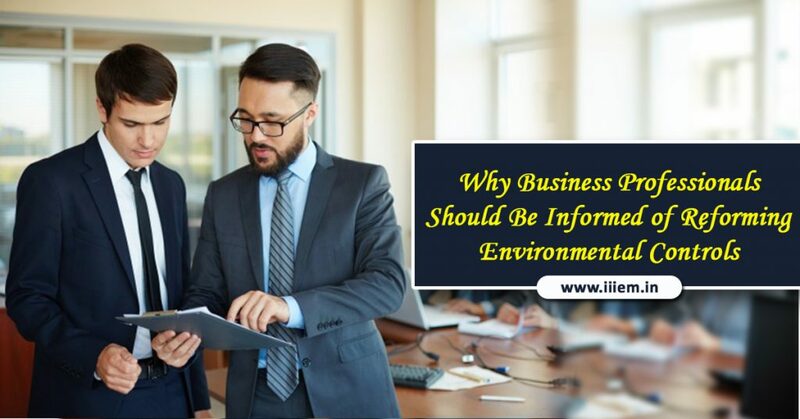 Purchaser awareness and purchasing capability ensure businesses are more receptive to making revisions to products, packages, and processes to make sure environmental concerns are worked upon, even if they are not controlled. Environmental controls – good or bad for international trade? Environmental security and sustainability, and their observed status as obstacles to competition and trade have been most-talked-upon topics in industrialized nations. Industries are concerned that actions to lessen the impact of industrial air pollution and controlled waste disposal would put them at a competitive weakness with their competition in other nations not subject to the same controls. On the opposite side of the issue, countries are concerned about nations with lax environmental controls. The concern is these nations will encourage businesses to relocate and set up manufacturing plants there, as opposed to working in countries that have executed controlled environmental policies. At the global level, there are movements to approach environmental concerns, including the assemblies on climate change. The World Trade Organization (WTO) augments sustainable growth as a guiding principle. It provides member nations with the choice of executing environmental business policies and controls required to protect the well-being and lives of animals and humans. However, these actions must not be executed purely as a disguised mode of regulating international trade. Manufacturing and marketing in nations with less rigorous environmental controls may be a cost benefit for businesses, but given the increase of consumer awareness, corporate social responsibly, and the adoption of the web for social analysis, it is essential to be conscious of the marketing implications of taking advantage of weaker environmental protection controls when working in other nations. An illustration of environmental compliance in effect is the condition from 2013 concerning micro-bead pollution. Microbeads carried in one container of facial scrub could transmit as many as 330,000 microbeads down the pipe, where they are too tiny to be cleaned out by wastewater facilities, and so they ultimately make their way into the lakes. Once in the lakes, the microbeads fall at the bottom and kill plant life, drawing hungry water creatures, who confuse them with fish eggs. Once ingested, the creatures cannot digest them due to the synthetic and, ultimately, the animals famish to death. The plastic masses in creatures along the food chain. Moreover, plastic acts as a sponge for pollutants like motor lubricants and pesticides. These poisons work their way into the bloodstreams of water creatures throughout the food chain, including fish eaten by people. Environmentalists state there is not much that can be done about the synthetic already settled in the lakes. Rather, they are directing their efforts at stopping more plastic from entering the water. Unilever, which holds soap companies including Noxema, Dove, and Axe, concluded the phase-out of microbeads in their produce by 2015. Brands like L’Oreal, Procter & Gamble, Colgate-Palmolive, and Johnson & Johnson are all in unity to cease applying microbeads in the produce. What moves has your company made to adhere to environmental controls? Let us know in the comments section below.